It was a slightly perkier prime minister than of late that entered the PMQs bear pit for yet another duffing up over Brexit. Jeremy Corbyn cut straight to the chase, asking the PM "What is her plan B?" Media captionJeremy Corbyn:"You know the scale of the crisis when the TUC and the CBI are united"
Mrs May repeated her regular form of words on the subject - her deal would deliver Brexit for the British people, and other options would lead to "delay, uncertainty and risk never delivering Brexit". The only problem, said Mr Corbyn, was that her deal has been twice defeated in the Commons, once by a record margin. Will she be supporting motions for a customs union when MPs vote later on different Brexit options? Mrs May said her deal would deliver all the benefits of a customs union, while allowing the UK to strike its own trade deals "in our interests" not the interests of Brussels. Mr Corbyn used to believe in that too, she told the Labour leader. But now, she claimed, he would prefer the EU to make the decisions on trade. The CBI and the TUC had both backed a customs union - these were "strange times indeed" when a Conservative government ignored the advice of business, Mr Corbyn told the PM. Labour's proposals did not begin "a race to the bottom", he declared. "Why is she prepared to risk jobs and industry in an attempt to run down the clock and blackmail MPs into supporting her deal," he asked. Mrs May said she has been negotiating to protect workers' rights and added "we are a government that has enhanced workers' rights". "The Labour Party can never stand it when they are told the Conservative Party has stood up for workers," she said. The prime minister was unable to guarantee dynamic alignment with European standards, said Mr Corbyn, and she knows full well that the Labour proposals are to use the EU standards as a baseline and to improve them. In his resignation letter, the business minister said he hoped Mrs May would act in the national interest and enable Parliament to find a consensus on a negotiating position, said Mr Corbyn. Will the prime minister accept the will of the House as the UK's base negotiating position, he asked. Mrs May said her objective was to fulfil the result of the referendum. 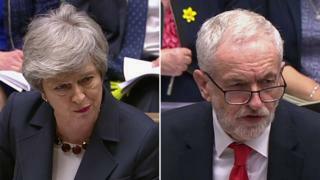 She hadn't answered his question, shot back the Labour leader, adding: "The country deserves to know whether the prime minister will abide by the decisions of MPs." "The prime minister is failing to deliver Brexit because she can't build a consensus. Either listen and change course or go - which is it to be?" The PM wrapped up their encounter in the traditional manner. "The biggest threat to our economy is sitting on the Labour front bench," she told MPs. The SNP's leader at Westminster Ian Blackford said the PM was about to announce her departure in a last attempt to get her deal through. Did she feel no sense of responsibility? he asked. Tory Brexiteer Andrew Bridgen accused the PM of breaking the trust of Tory voters by "begging our EU masters" to delay Brexit. 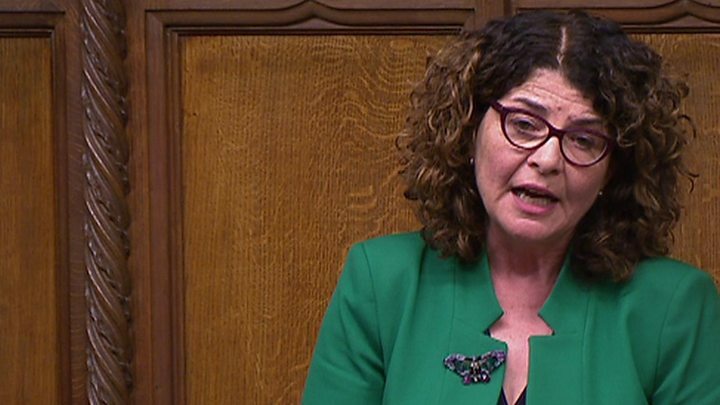 Labour's Chi Onwurah asked the PM to contemplate the impact of Brexit on businesses and individuals, and consider whether she was making a "terrible mistake". 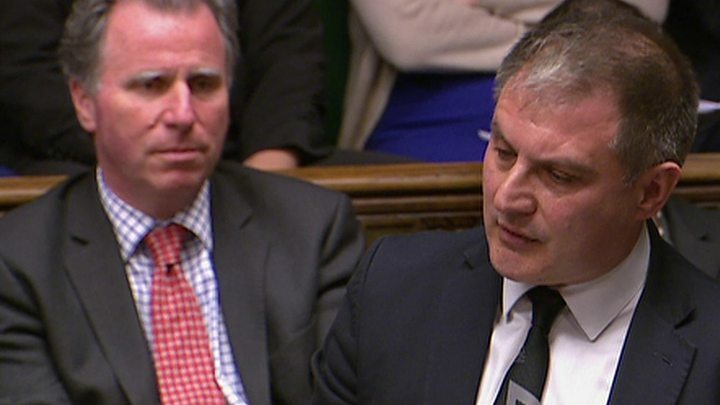 Conservative MP Jack Lopresti highlighted what he called the "politically-motivated witch hunt" of army veterans who had served in Northern Ireland. Veteran Tory Brexiteer Sir Bill Cash asked the prime minister to publish her advice from the Attorney General about changing the date the UK leaves the EU. 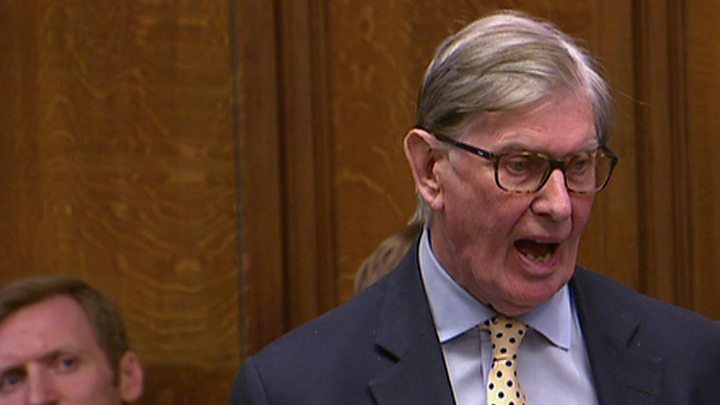 Media captionBill Cash asks the MP to publish her advice from the attorney general about changing the date of Brexit. 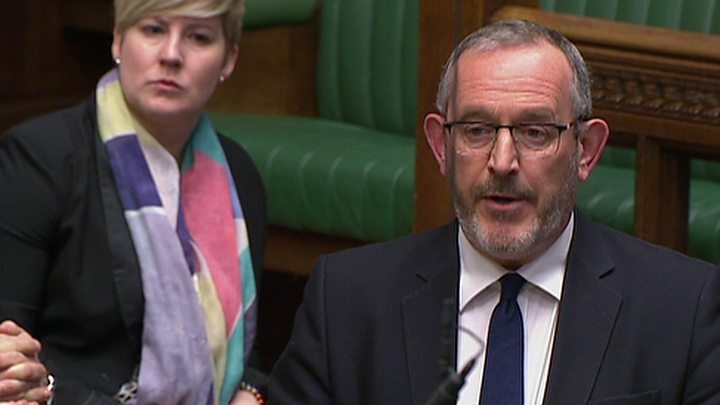 The SNP's Stewart Hosie asked the PM when she would resign over Brexit "chaos". Media captionTheresa May is told she is "liable, responsible, culpable for the chaos" of Brexit by the SNP's Stewart Hosie. Hull Labour MP Diana Johnson claimed the much-vaunted Northern Powerhouse had "stalled". Ho-hum. This was one of those occasions where a combination of the way PMQs is set up, and poorly targeted questioning, meant that there was little to be learned, at least directly. The chewiest news nugget to emerge was probably the Brexiteer Conservative Andrew Bridgen's direct challenge to the PM - saying his constituents would never forgive her for postponing Brexit day. Chewy because the question indicated the mood of a clear Conservative faction, and was couched in such scathing terms. The PM's answering put-down, that if he had wanted Brexit on schedule, he should have voted for her deal, was delivered with a certain confidence, and she did seem in less faltering form today. The other thing to notice was the lack of follow up for Mr Bridgen; a succession of angry Brexiteers delivering a creeping bombardment on their leader would have been a very bad sign for the PM. But there was no sign of any pre-coup softening up - rather the reverse. The SNP's Ian Blackford said the PM should take responsibility for the state of the Brexit process and accused her of preparing to resign, having left a mess behind her. 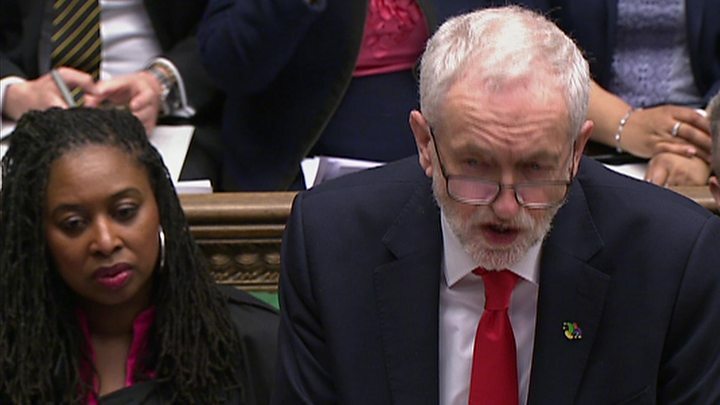 Jeremy Corbyn finally got to his most telling point with his final question; would the prime minister seek to implement the will of the Commons, if MPs do manage to come up with an agreed version of Brexit? But when she brushed it off, he was left with no opportunity to press her further.